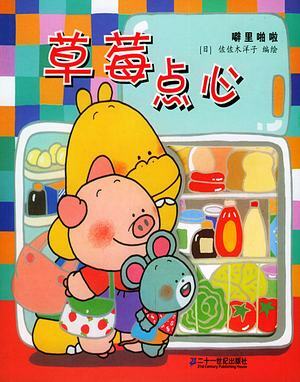 One type of picture book used in Chinese with Meggie is an interactive book. Teachers at Chinese with Meggie use these types of books as great tools in facilitating the output of target language vocabulary. Here is an example from Chinese with Meggie’s immersion class program. After children’s snack time, the teacher planned to read a story about different animal’s meeting for lunch in a forest. We initially introduced many of the friendly and colorful animals featured in the book, such as “大象”(elephant), “老虎(tiger)”,“熊(bear)”,etc. Once we had captured the imagination of the children, the teacher started the interactive element of the class as she read the story. The interactive elements in the book attracted the children’s attention throughout the whole of the storytelling process, as it required students to discover the plot by themselves. On one page of the book, every animal is holding their own lunchbox. However, we could not see what was inside the box as the box was covered with a paper lid. With the natural characteristic of children’s curiosity, they were eager to discover what exactly those animals would have for lunch. The teacher asked each student to lift the small paper lid in the book one by one, and tell everyone the answers in Chinese. Therefore, we had our students produce the words instead of the teachers just telling them the words. Underneath the paper lid, there was an abundant variety of “foods” that helped the children to learn the target vocabulary such as “鸡蛋(egg)”,“肉(meat)”,“青菜(vegetable)”,“寿司(sushi)” etc. Learning language involves both input and output. At Chinese with Meggie, we have multiple ways to facilitate children to achieve both sides. Using interactive books is an effective and motivational way for children to discover the language by themselves. They enjoy activities which require them to participate more. It’s a wonderful experience for both children and teachers to realize the power of language. This entry was posted in Immersion Chinese, The Magic of Picture Books and tagged Austin, Chinese Immersion, Picture Book, TX by cwmmeggie. Bookmark the permalink.